The momentous event happened at 7.15 a.m. local time on the last day of June 1908. At that precise moment, an object brighter than the morning sun ripped through the atmosphere over Siberia. A trainload of passengers on the trans-Siberian railway stared in horror at the towering pillar of flame roared through the clear blue skies at a phenomenal velocity of around one mile per second. The sonic boom given off by the sky invader shook the railway track, convincing the engine driver that one of his coaches had been derailed. The driver jammed on the brakes and as the train screeched to a grating halt, the mysterious fiery object thundered north. The trembling train passengers listened in relief as the overhead danger became fainter, and many of them looked out the windows of the carriages and eyed the vapour trail with bafflement. The tubular shaped object then proceeded for another 150 miles before exploding over the Tunguska valley. The detonation occurred at a height of five miles, and the 12-megatonne explosion (it might have even been 30 megatonne) destroyed everything within a radius of 20 miles. Herds of reindeer were incinerated as they stampeded away from the explosion, and all wildlife in the area was ignited by the searing heat blast. Thirty-seven miles from the blast, the tents that the frightened Evenki people had taken refuge in were lifted high into the air by the resulting atmospheric shock wave, and the Evenki’s horses galloped off in terror, dragging their ploughs with them. At the centre of the explosion a monstrous mushroom cloud rose steadily over Siberia. Such a strange and unsettling sight would not be witnessed for another thirty-seven years at Hiroshima and Nagasaki. But this explosion was even fiercer than the A bombs which were dropped on the Japanese cities. 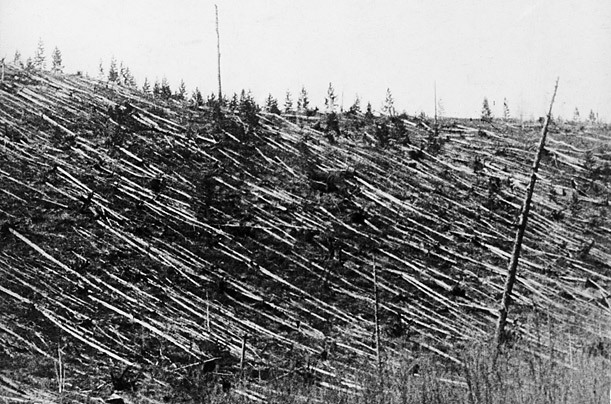 The blast from the Tunguska explosion felled trees as if they were matchsticks for 20 miles around and set whole forests alight. The shockwave generated by the mysterious cataclysm travelled around the world twice and shook the recording pens of the microbargraphs at three meteorlogical stations in London, where they were interpreted as seismic jolts from some distant earthquake.